Isaac ALLERTON (1586 – 1659) was one of the original Pilgrim fathers who came on the Mayflower to settle the Plymouth Colony in 1620. (Wikipedia) While serving as Plymouth’s business agent he used the colony’s collateral for his own failed business ventures. He is the only Mayflower Pilgrim with a house on Broadway (yes, that Broadway). He was Alex’s 11th Grandfather; one of 4,096 in this generation of the Shaw line. Isaac Allerton was born in 1586 in London, England. His parents were Edward ALLERTON and Rose DAVIS. He married Mary NORRIS 4 Nov 1611 in Stadhuis, Leyden, Holland. Accompanying Isaac and Mary on the Mayflower were their three children and a servant boy named John Hooke, who was 14. Allerton’s wife and John Hooke died aboard the Mayflower while it was still anchored in Plymouth Harbor during the first winter, as noted in the death lists. Both were buried in Cole’s Hill. After Mary died, he married Fear Brewster about 1625. After Fear died, he married a third time to Joanna Swinnerton in Marblehead, Mass sometime between 1634 and 17 Feb 1645 when they arrived in New Haven. Isaac died of plague between 1 and 12 Feb 1658/59 in New Haven CT.
Isaac Allerton – Sargent Painting “Landing of the Pilgrims”. Isaace Allerton – Sargent Painting Detail The artist identified the individuals in his painting. Mary Norris was born about 1592 in Newbury, Berkshire, England. Mary died from the effects of childbirth, after giving birth to a stillborn son on February 25, 1621. Mary was the first woman to give birth in the New England Colonies. Fear Brewster (Wikipedia) was born in 1606 in Scrooby, Nottinghamshire, England. She was named Fear because at the time of her birth, the Puritans were holding secret meetings and were under constant threat of arrest. Her parents were William BREWSTER and Mary Love. Her early years, and indeed her whole life, were full of unrest. In 1608 she moved, along with the other pilgrims, to Amsterdam (and later Leiden). Fear was only 14 when her parents and two younger brothers, Love and Wrestling, left for America on the Mayflower. She was left in the care of her older siblings, Jonathan (born in 1593) and Patience (born in 1600). Jonathan joined the pilgrims in 1621 on board the Fortune. Fear arrived in America with Patience on board the Anne in July 1623. Fear died 12 Dec 1634 in Plymouth, Mass. Joanna Swinnerton’s origins are not known. There was a Job Swinnerton, admitted to Salem, near Marblehead, in 1637, but his wife’s name was Elizabeth. Job Swinnerton, born about 1601; married Elizabeth, perhaps in Eccleshall, Staffordshire, England, and lived in Salem Village. A private record in the possession of the family states that when he and his wife were aged and infirm their house “took fire on the roof, in the absence of their family, and before they discovered it, all retreat from the door was cut off. Mr. Swinnerton escaped from the window, holding his wife’s hand, but did not succeed in rescuing her from the flames. When the son returned he found his father sitting on a rock, viewing the smoking coals, and on inquiring for his mother, his father replied, she has gone to heaven in a chariot of fire.” Mr. Swinnerton died April 11, 1689. Children: 1. Job, born about 1630; 2. John, born about 1633. Joanna was probably the “Mrs. Swinnerton” who received a grant of land at New Haven on 17 March 1640/41 [NHCR 1:50; NEHGR 124:133; MD 42:124]. No children of this marriage. Joanna died after 19 May 1684 New Haven, New Haven, CT. In a deed dated Dec 23 1703 Elizabeth Eyre, a granddaughter of Isaace Allerton sold this piece of land that had come to her as a granddaughter of Joanna Swinnteron after Joanna Alderton late of New Haven deceased. Based on these deeds, it looks like Isaac married Joanna in New Haven. 6 May 1635 12 Sep 1652 Marblehead, Mass. 3. Mary ALLERTON Jun 1616 Leyden, Holland Thomas CUSHMAN Sr.
Plymouth 28 Nov 1699 Plymouth, Mass. Some historians use the words “unlucky” and “unscrupulous” to describe Allerton. He used his capacity as Plymouth’s designated negotiator to engage the Colony in a number of unapproved, and ultimately failed trading schemes. However, he eventually paid back his debts. In 1646, Allerton asked Bradford, Brewster, Winslow and Standish to be his agents and sell his lands, goods and cattle to clear all his debts and demands of the undertakers that were uncovered in 1630/31. I see Allerton as the first “Yankee Trader.” The historical records of New Amsterdam, New Haven and New Sweden contain no evidence that his trading practices were unscrupulous. Johan Rising, Governor of New Sweden recorded that Allerton drove a “sharp bargain,” but so did all trader merchants of the time. While other men rose to prominence as political leaders, Allerton achieved success in the world of commerce. He overcame adversity three times in his life and recovered to build four successful careers. After fleeing Suffolk County England, Allerton, Brewster and Priest displayed such enterprise in the Netherlands that they were granted honorary citizenship in Leiden. Allerton survived the Mayflower voyage and the horrific first year in Plymouth and rose to become Assistant Governor and London agent. He left Plymouth in disgrace, began a thriving fishing enterprise in Marblehead only to be expelled because of his freethinking religious views and friendships with Thomas Morton and Roger Williams. Beginning anew for the fourth time he became one of New England’s most successful trader-merchants and a prominent citizen of both New Haven and New Amsterdam. Isaac Allerton was about 34 years old when he came to Plymouth on the Mayflower in 1620. He had been a long-time member of the Pilgrims’ church in Leiden, and was recorded as having been a tailor from London. He married his first wife, Marry Norris, in Leiden, in 1611, and there had children Bartholomew, Remember and Mary, all of whom came on the Mayflower with him. He and Mary buried a child, not yet named, at St. Peters on 5 Feb 1620. 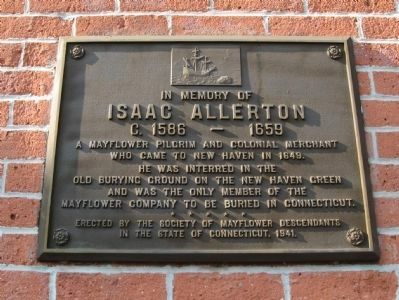 Isaac Allerton had a sister Sarah in Leiden, who married to Mayflower passenger Degory Priest. 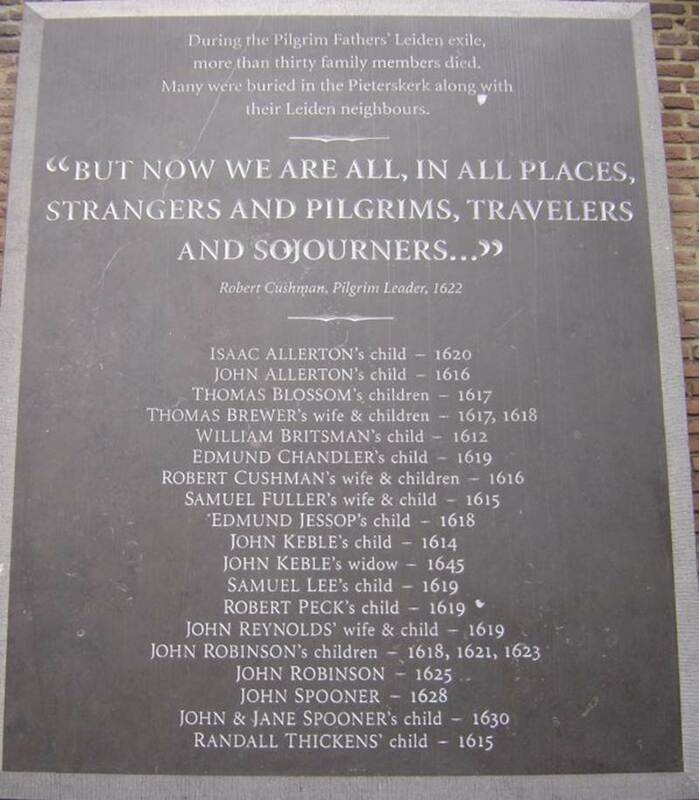 Mayflower passenger John Allerton, also a Leiden resident, most likely was a relative as well, although the exact relation has not been discovered. Isaac Allerton was one of the more active and prominent members of early Plymouth. He was elected as Governor Bradford’s assistant in 1621, and continued as an assistant into the 1630s. In 1627, he was sent to negotiate the Plymouth Colony’s buyout of the Merchant Adventurers, the investors who had originally funded (and had hoped to profit from) the Colony. The Colony was about £2500 in debt; a small group of Plymouth’s residents, including Bradford, Brewster, Standish, Fuller, and Allerton, sought to assume the debt themselves in return for the rights to profit from the company. Which cried out in hell+Blessed are the mercyfull+Wh-t was to late. Allerton was sent to England to negotiate further, and would return to England on several more occasions. Unfortunately for the others, Allerton began to use his “free” trips to England to engage in some private gains, purchasing goods and selling them in the Massachusetts Bay and Plymouth. He also used his capacity as Plymouth’s designated negotiator to engage the Colony in a number of unapproved money-making schemes: he went so far as to purchase ships (which he partially used for his own private trading), and to attempt to negotiate grants and patents for trade–all at great cost to the company and none of it approved by the others back at Plymouth. When his trading schemes failed, the Company found itself in far greater debt than it ever started out with. However, he eventually paid back his debts. In 1646, Allerton asked Bradford, Brewster, Winslow and Standish to be his agents and sell his lands, goods and cattle to clear all his debts and demands of the undertakers that were uncovered in 1630/31. While serving as the colony’s business agent, Allerton began several business ventures of his own, relying on the colony’s credit for collateral. These ventures failed, thus leaving his colleagues back in Plymouth saddled with a greatly increased debt. Also, Allerton was asked to bring over trade goods to sell to the natives, however, Allerton brought over retail goods to sell to the colonists and fishermen who came over every year. Later on Allerton did not mark which goods were his and which belonged to the colony. When the goods were unloaded, Allerton took the most expensive items leaving the Plymouth colonists with the cheaper goods. In 1630/31, Bradford dismissed Allerton as Plymouth’s London business agent because he betrayed the colony’s trust by overcharging, mishandling the colony’s finances and increasing the colony’s debt without approval. Believing his work was misunderstood and unappreciated, Allerton decided to trade for himself. Allerton’s stature in the colony was substantial, and he continued living in Plymouth with his wife and children and was elected Assistant Governor in 1633/34. At this time Allerton was the wealthiest man in Plymouth and the largest taxpayer. Jun 1632 – Allerton and James Sherley (an original Merchant Adventurer and Undertaker) formed a trading company and built trading stations on the Kennebec and Penobscot Rivers. Sep 1632 – Allerton and Moses Maverick ( husband of his oldest daughter, Remember), sailed the White Angel (leased from James Sherley) into the harbor at Marblehead. Allerton and Maverick purchased fishing vessels, built a warehouse and quarters for fishermen. By 1633 they had five men and eight boats fishing in the harbor. 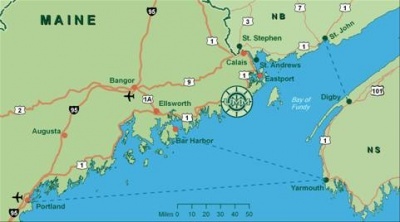 In 1633 they built a second warehouse and fisherman’s quarters at Machias on Maine’s north coast. Maverick and Allerton were among the original settlers of Marblehead. In 1633/34 Allerton experienced a series of misfortunes. The French and Indians destroyed his fishing facilities in Machias and one of his ships was lost at sea while trading with France. A fierce contest was at this time going on between France and England. Charles de la Tour, the French commander of Acadia, made a descent upon it from his seat at Port Royal, Nova Scotia, killing two of its six defenders, and carrying the others away with their merchandise. No persistent attempt was again made to hold this point by the English or French for upwards of 120 years. In February 1634 the living quarters housing Allerton and his fishermen in Marblehead was destroyed by fire. Plymouth suffered an epidemic and Allerton’s second wife, Fear, daughter of William Brewster, died of fever in Dec 1634. Allerton conveyed his Plymouth property at Rocky Nook (later called Kingston) to his youngest daughter Mary (1616-1699) and her husband Thomas CUSHMAN. Allerton angered the Massachusetts Colony General Court by embracing freethinking religious views. He employed as secretary, Thomas Morton of “Merrymount,” whose religious beliefs and unacceptable personal behavior caused him to be involuntarily returned to England in 1629. In addition, Morton and Allerton befriended Roger Williams whose extreme separatist views offended the Puritan ministers. Williams was banished and established a colony in Providence, RI. In March 1635 the civil authorities ordered Allerton to leave Marblehead and in May he conveyed his Marblehead fishing properties to Moses Maverick and moved to New Amsterdam. Moses remained in Marblehead to become a leader in New England’s fishing industry, and one of Marblehead’s leading citizens holding many positions of civic authority throughout his life. The Great Colonial Hurricane of 1635 damaged much of the area between Providence, Rhode Island and the Piscataqua River ; some damage was still noticeable 50 years later. A letter from Governor William Bradford said that the storm drowned seventeen Native Americans and toppled or destroyed thousands of trees; many houses were also flattened. From an account by Antony Thacher, there were twenty-three people aboard a little bark named the Watch and Wait and owned by a Mr. Isaac Allerton. The boat sank, and Thacher and his wife were the only ones to survive the shipwreck. Thus the island off Cape Ann—where Thacher survived—was named in his honor and is still known as Thacher’s Island. In Narragansett Bay, the tide was 14 feet above the ordinary tide and drowned eight Native Americans fleeing from their wigwams. The highest ever such recorded value for a New England Hurricane, a 22-foot storm tide, was recorded in some areas. A recent study indicates that this hurricane was very likely the most intense hurricane to ever impact the New England region in recorded history. 26 Sep 1636 – Isaac made a deposition in Boston stating he was aged about 53 yrs. Isaac was soon commanded by the Massachusetts authorities to leave the colony. In 1629 Allerton brought Thomas Morton (Wikipedia) back to New England, and allowed him to live in his house; this got the Plymouth colonists very upset. This rendered Allerton permanently persona non grata in Plymouth. “Mr. Allerton played his own game and ran a course not only to the great wrong and determent of the Plantation… but abused them in England also in prejudice against the Plantation,” and later on he wrote “Concerning Mr. Allerton’s accounts. They were so large and intricate as they could not well understand them, much less examine and correct them without a great deal of time and help and his own presence, which was hard to get,” and also “he screwed up his poor father in law’s account”. Morton spent three months on an exploratory trip to America in 1622, but was back in England by early 1623 complaining of the intolerance of certain elements of the Puritan community. He returned in 1624 as a senior partner in a Crown-sponsored trading venture, onboard the ship the Unity with his associate Captain Wollaston and 30 indentured young men. They settled and began trading for furs on a spit of land given them by the native Algonquian tribes, whose culture Morton is said to have admired as far more ‘civilized and humanitarian’ than that of his ‘intolerant European neighbours’. The Puritans of the New England colony of Plymouth objected to their sales of guns and liquor to the natives in exchange for furs and provisions, which at that time was technically illegal (although almost everyone was doing it). The weapons undoubtedly acquired by the Algonquians were used to defend themselves against raids from the Northern Tribes, however, and not against the fearful colonists. The trading post set up by the two men soon expanded into an agrarian colony which became known as Mount Wollaston (now Quincy, Massachusetts). Morton fell out with Wollaston after he discovered he had been selling indentured servants into slavery on the Virginian tobacco plantations. Powerless to prevent him, he encouraged the remaining servants to rebel against his harsh rule and organise themselves into a free community. Wollaston fled with his supporters to Virginia in 1626, leaving Morton in sole command of the colony, or its ‘host’ as he preferred to be called, which was renamed Mount Ma-re (a play on ‘merry’ and ‘the sea’) or simply Merrymount. Under Morton’s ‘hostship’ an almost utopian project was embarked upon, in which the colonists were declared free men or ‘consociates’, and a certain degree of integration into the local Algonquian culture was attempted. 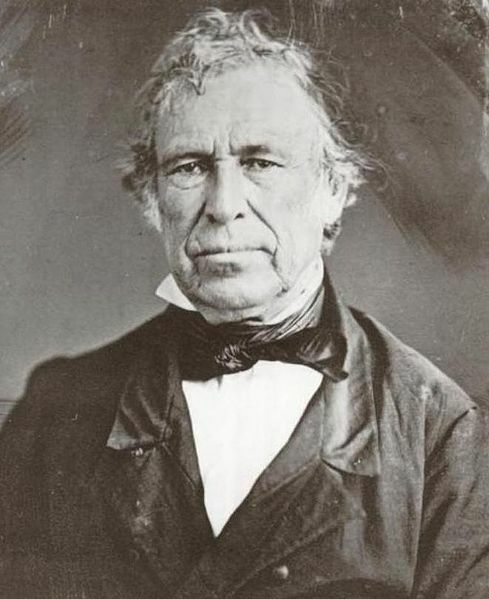 However, it was Morton’s long-term plan to ‘further civilize’ the native population by converting them to his liberal form of Christianity, and by providing them with free salt for food preservation, thus enabling them to give up hunting and settle permanently. He also considered himself a ‘loyal subject’ of the British monarchy throughout this period, and his agenda remained a colonial one, referring to Book 3 of his New English Canaan memoirs as a manual on ‘how not to colonize’, in reference to the Puritans. Morton had transplanted traditional West Country May Day customs to the colony, and combined them with fashionable classical myth, couched according to his own libertine tastes, and fuelled by the enthusiasm of his newly-freed fellow colonists. On a practical level the annual May Day festival was not only a reward for his hardworking colonists but also a joint celebration with the Native Tribes who also marked the day, and a chance for the mostly male colonists to find brides amongst the native population. Puritan ire was no doubt also fueled by the fact that Merrymount was the fastest-growing colony in New England and rapidly becoming the most prosperous, both as an agricultural producer and in the fur trade in which the Plymouth Colony was trying to build a monopoly. The Puritan account of this was very different, regarding the colony as a decadent nest of good-for-nothings that annually attracted “all the scum of the country” to the area. Or as Peter Lamborn Wilson more romantically puts it, ‘a Comus-crew of disaffected fur traders, antinomians, loose women, Indians and bon-vivants’. But it was the second 1628 Mayday ‘Revels of New Canaan’, inspired by ‘Cupid’s mother’, with its ‘pagan odes’ to Neptune and Triton, as well as Venus and her lustful children, Cupid, Hymen and Priapus, its drinking song, and its erection of a huge 80 ft. Maypole, topped with deer antlers, that proved too much for the ‘Princes of Limbo’, as Morton referred to his Puritan neighbours. 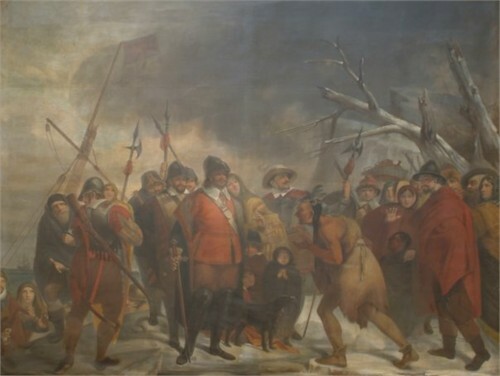 The Plymouth Militia under Myles Standish took the town the following June with little resistance, chopped down the Maypole and arrested Morton for ‘supplying guns to the Indians’. He was put in stocks in Plymouth, given a mock trial and finally marooned on the deserted Isles of Shoals, off the coast of New Hampshire, until an ‘English ship could take him home’, apparently as he was believed too well connected to be imprisoned or executed (as later became the penalty for ‘blasphemy’ in the colony). He was essentially starved on the island, but was supplied with food by friendly natives from the mainland, who were said to be bemused by the events, and he eventually gained enough strength to escape to England under his own volition. The Merry Mount community survived without Morton for another year, but was renamed Mount Dagon by the Puritans, after the ‘evil’ Semitic Sea God, and they pledged to make it a place of woe. During the terrible winter famine of 1629 residents of New Salem under John Endecott raided Mount Dagon’s plentiful corn supplies and destroyed what was left of the Maypole, calling it the ‘Calf of Horeb’ and denouncing it as a pagan idol. Morton returned to the colony soon after and, after finding most of the inhabitants had been scattered, was rearrested, again put on trial and banished from the colonies without legal process. The following year the colony of Mount Dagon was burnt to the ground and Morton shipped back to England. Between 1636 and 1642 Allerton’s activities are not well known. There is not evidence that he had a permanent home in New Amsterdam. He may have traded for himself, or the WIC, or for wealthy Dutch family trading companies in New Amsterdam. Allerton established good relations with Director-General William Kieft and was granted “burger privileges” as a resident of New Amsterdam. One of the earliest records of Allerton’s trade in New Amsterdam was trading corn with Director-General William Kieft in 1639. In 1642 Allerton sold his bark, Hope, to New Amsterdam residents Govert Loockermans and Cornelius Leendertsen. Allerton and Loockermans became partners in trading and in 1643 were granted permission to buy land on the east side of Broadway, which they sold shortly thereafter. Loockermans became a wealthy landholder, and influential in the governance of New Amsterdam, both before and after being seized by the English. Director-General William Kieft was an autocrat and ruled New Amsterdam in an arbitrary fashion, generating animosity throughout the colony. In 1643 a minor altercation with Indians evolved into a serious uprising followed by an ugly slaughter of Weckquaskeek Indians on Manhattan Island. Kieft feared a major Indian assault. Allerton was asked by Kieft to join a Council of eight men to help New Amsterdam. For more on William Kieft and New Amsterdam politics in the 1640;s , see the page of our ancestor Hendrick Thomasse Van DYKE (1610 – 1688) Van Dyke commanded an attack in Kieft’s War in 1643 and occupied several high official positions in the colony. While his unenviable reputation for starting the Peach Tree War (1655-1660) by shooting a Native American woman picking peaches on his property may be an exaggeration of the actual events, he did have a gruff personality and was often involved in controversy both with Director General Stuyvesant and the Indians. Because he was English and respected in New Haven, Kieft sent Allerton and another Englishman to New Haven in 1643 to ask for men and materials to help defend New Amsterdam. In addition, the Council of eight men was asked to propose measures to improve civility and law-and-order in New Amsterdam. New Haven refused to send men to support the Dutch but Kieft entered into an agreement with the Indians in 1645 that settled the dispute. In 1646 Allerton purchased a narrow, 500-ft strip of waterfront property on the East River a mile north of the tip of Manhattan and constructed a two-story warehouse and dock. The warehouse was managed by George Woolsey from Yarmouth, England. The warehouse at 170 Pearl Street became known as “Allerton’s Building” and was a favorite place where English traders convened when conducting business in New Amsterdam. The northern end of the land was called Peck’s Slip where a ferry provided service across the East River to Brooklyn. In 1654 the house was used as an almshouse for boys and girls from the Netherlands “bound-out” for employment in New Amsterdam. In 1656 Woolsey received permission to sell beer and wine and to operate the house as an inn. After Allerton’s death, George Woolsey lived in the house until 1668. The building survived into the 18th century at a location that today would be between the South Street Seaport and the Brooklyn Bridge. By 1655 Allerton was recorded to be the sixth wealthiest resident in New Amsterdam. Because of Kieft’s dictatorial manner, several of the eight men petitioned the States-General to recall Kieft as Director-General and that the people themselves be given more influence in the new government. They blamed Kieft for the declining economic condition of the nascent colony, and Keift’s War. Kieft was dismissed and replace by Peter Stuyvesant who would rule New Netherlands until its defeat by the English in 1664. The men initiating the recall petition were accused of insurrection and faced punishment. Allerton was the second signatory of the petition but was not the group’s primary spokesman. While maintaining ties in New Amsterdam, in 1646, Allerton established a permanent residence in New Haven. New Sweden and New Netherlands. Allerton was unique among all the 17th century New England trader merchants because he was an influential resident in both New Amsterdam and New Haven. As a resident in both colonies, he engaged in trade free of the restraints New Amsterdam imposed on English traders, and New Haven imposed on Dutch traders. Thus Allerton was able to trade in English colonies in North America, Swedish and Dutch settlements on the Delaware River. Trade records show that he also traded in ports in England and the Netherlands, Curacao, the Barbados, Virginia, New Amsterdam, New England and Canada. 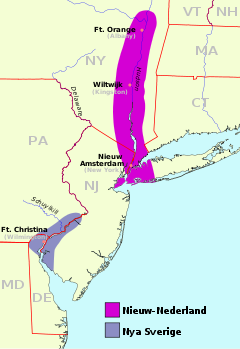 During the testy years when New Amsterdam and New Sweden were at sword’s points, Allerton traded in New Sweden while not antagonizing the Dutch and obtained goods that he transported to New Amsterdam for shipment to Europe in Dutch ships. Other English traders were less successful from trading with the Swedish and Dutch on the Delaware. Ships from Sweden were unable to provide a reliable stream of supplies to the New Sweden settlements and the settlers depended on visits from Dutch trader merchants. Using his sloop, Allerton began trading in New Sweden and remained one of its principal and reliable traders until he retired. Jan 1644 – Allerton sold goods at Fort Christina. Jun 1644 – He sold 11,346 pounds of tobacco for 5 stivers per pound (Dutch money, 20 stivers = 1 guilder). Fall 1645 – He returned to collect his outstanding accounts and sold 14 bushels of barley seed, a pair of millstones and Dutch bushel measures. Fall 1647 – Allerton returned to collect 3,800 florin (British money, florin = 2 shillings) on his accounts. 1651 – Allerton was a witness to an agreement in which the Indians granted the Dutch land south of Fort Casimir. 1654 – Allerton sold 13,519 pounds of Virginian tobacco at 9 stivers per pound and if the Swedes were unable to receive a gross profit of 7 stivers per pound that they expected in Europe, he agreed to reduce his price. 1654/6 – Allerton acted as courier and interpreter for the Governors of New Haven and New Sweden concerning permission for the English to build a settlement on the Delaware based on an agreement the English made with the Indians in 1641. The request was refused. 1655 – Allerton brought food, vinegar, hops to Christina on credit. 1656 – He transported goods from Christina for sale in New Amsterdam. These trading practices illustrate a way for the Governor of New Sweden ensured steady visits from merchant traders. Using both credit and currency the Governor knew that the trader merchants would return to redeem credit owed them. For their part, Allerton and other trader merchants offered credit to ensure that their return with new supplies would be welcomed. Owing to the shortage of European currency and manufactured goods in New Sweden, Indian wampum became a common medium of exchange in the fur trade. Wampum were beads Indians made from clam shells and strung on strings, woven into belts or sewn on garments as ornaments. Indians along the Delaware River valued wampum made by New England Indians from clam shells found in the Narragansett Bay and from the shores of Long Island Sound. Making wampum was a time-consuming craft in which the Narrgansetts excelled. Wampum made by the English was inferior and less valuable in trade. Indians with whom New Sweden traded prized New England wampum as the medium of exchange in trade for furs. Allerton acquired New England wampum extensively, he often acted as a courier carrying passengers, important documents, letters of credit between Dutch, English and Swedish colonies. In New Haven he remained an active trader, and did regular business with the Dutch at New Netherland in modern-day New York. 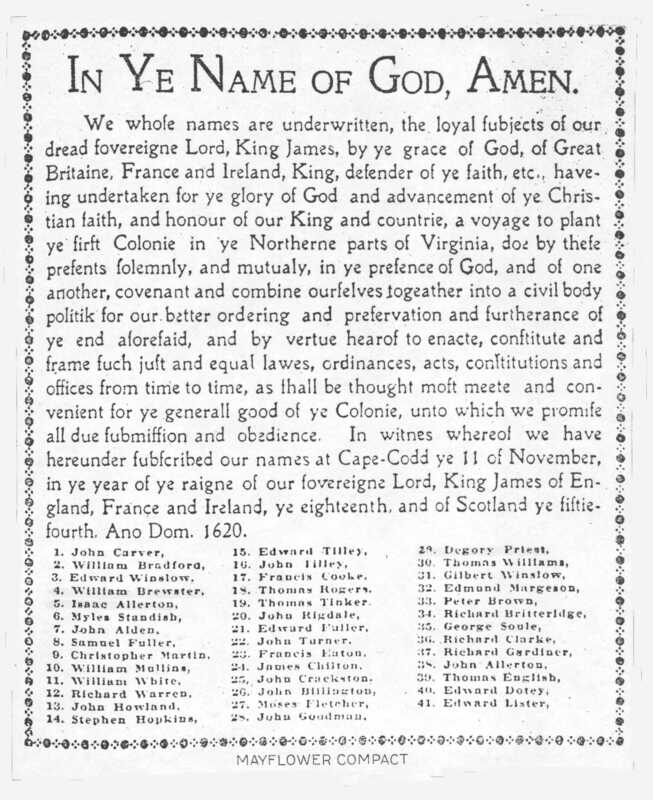 Records of his trading can be found in numerous other colonies as well, including Virginia and Barbados. 1646 – Allerton asked Bradford, Brewster, Winslow and Standish to be his agents and sell his lands, goods and cattle to clear all his debts and demands of the undertakers that were uncovered in 1630/31. 1646 – Allerton became a permanent resident of New Haven where he and his wife lived for the remainder of his life except for trading voyages and occasional visits to his warehouse in New Amsterdam. 13 Oct 1646 – Isaac Allerton was called “of Newhaven Merchant” in a letter of attorney. 27 Oct 1646 – Isacke Allerton of New Amsterdam in the province of New Netherlands, merchant, confirmed to son-in-law Thomas CUSHMAN of New Plymouth a debt of one hundred pounds owed to Isaac by John Coombe. 10 Mar 1646/47 – Isaac and Joanna were assigned seats in the New Haven meeting house. He built a stately home with four porches and many fireplaces on two acres of land on the creek on the northwest corner of Union Street between Cherry Street on the north, and Fair Street on the south. The home was located among the grand homes of Davenport, Eaton and other original New Haven settlers. He remained an active trader and did regular business with the Dutch at New Amsterdam (modern-day New York), the Finns and Swedes at New Sweden (consisting of parts of present day Delaware, New Jersey and Pennsylvania), Virginia, and Barbados. The burgomasters of New Amsterdam appointed Allerton’s son, and his business associates, Loockermans, Leendertsen, George Woolsey, and John Lawrence to be curators of his trading business which included ships, warehouse and real estate in New Amsterdam. In spite of his reputation as one of New England’s wealthiest merchants, Allerton died insolvent with debts to creditors located in many of the ports in which he traded. Joanna, in 1660. Joanna died in 1682. The home was taken down in 1740. 4 Oct 1660 – Allerton’s son Isaac Jr. purchased his father’s New Haven home from his creditors and deeded it to his stepmother, Mrs. Johanna Allerton during her life and then to his daughter Elizabeth Allerton and her heirs. The deed was not witnessed, so on 10 March 1682/83 Isaac Allerton confirmed the deed. 1661 – Allerton’s widow, Joanna sheltered Edward Whaley and William Goffe, the Regicide Judges who sentenced Charles I to be beheaded and who were now being pursued by the agents for Charles II to be returned for trial in England. Due from John Snedecare a shoomaker 150, od gilders as by his acco appeares. Peter Cornelioussen 120. od guilders as by ye account will appeare. My brother Bruster owes mee foure score pounds & odd. as the obligations will appeare. Bartholmew’s wife Sarah Fairfax was born 1612 in Suffolk, England Sarah died in 1678 in Halesworth, Suffolk, England. 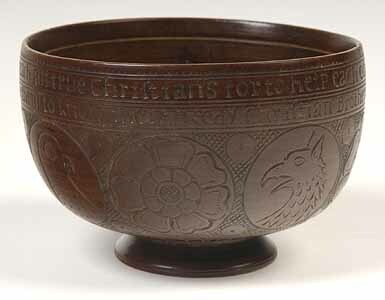 He, his parents, and his sisters Remember and Mary came to Plymouth on the Mayflower in 1620. At some point, Bartholomew returned to England and took up residence in Norfolk and later Bramfield, Suffolk. A 1657 chancery suit, a couple of letters in the British Library, and his 1658/59 will are the known records of his life in England. Nobody has successfully documented descent from Bartholomew Allerton, but he probably does have some descendants living in England, if information about his children could be further traced. Remember’s husband Moses Maverick was born 1610 in Awliscombe, Devon, , England. Moses died 28 Jan 1685 in Marblehead, Essex, Mass. Moses Maverick came to Massachusetts about 1630, perhaps on the ship Mary and John. Remember and Moses took up residence in Marblehead, and later moved to Salem about 1640. She died sometime after the birth of her last child, Remember, and husband Moses remarried a few years later to widowed Eunice (Cole) Roberts, and had an additional four children (Mary, Moses, Aaron, and Sarah). Sep 1632 – Moses Maverick his father-in-law Isaac Allerton, sailed the White Angel (leased from James Sherley) into the harbor at Marblehead. Maverick and Allerton purchased fishing vessels, built a warehouse and quarters for fishermen. By 1633 they had five men and eight boats fishing in the harbor. In 1633 they built a second warehouse and fisherman’s quarters at Machias on Maine’s north coast. Maverick and Allerton were among the original settlers of Marblehead. In March 1635 the civil authorities ordered Isaac Allerton to leave Marblehead and in May he conveyed his Marblehead fishing properties to Moses Maverick and moved to New Amsterdam. Moses remained in Marblehead to become a leader in New England’s fishing industry, and one of Marblehead’s leading citizens holding many positions of civic authority throughout his life. Sarah’a huaband John Priest was born 1616 in Leyden, , South Holland, Netherlands His parents were Mayflower passenger Degory Priest and Sarah Allerton. John died 1704 in Lancaster, Worcester, Mass. Degory Priest deposed that he was 40 years old in a document signed in Leiden in April 1619; this would place his birth at about 1579 in England. On 4 November 1611, he was married to Sarah (Allerton) Vincent, the widow of John Vincent, and the sister of Mayflower passenger Isaac Allerton; Isaac Allerton was married to his wife Mary Norris on the same date. It has been suggested that Degory Priest of the Mayflower may have been the Degorius Prust, baptized 11 August 1582 in Hartland, Devon, England, the son of Peter Prust. However, given that the baptism appears to be about 3 years too late, and the fact that none of the Leiden Separatists are known to have come from Devonshire, I doubt this baptism belongs to the Mayflower passenger. 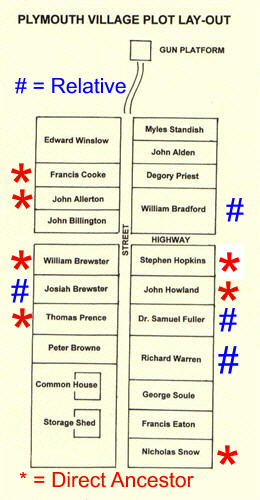 Degory Priest was one of the earliest to have arrived in Leiden, so it is more reasonable to suspect he is from the Nottinghamshire/Yorkshire region, the Sandwich/Canterbury region, the London/Middlesex region, or the Norfolk region: all of the early Separatists in Leiden appear to have come from one of these centers. Degory and wife Sarah had two children, Mary and Sarah. 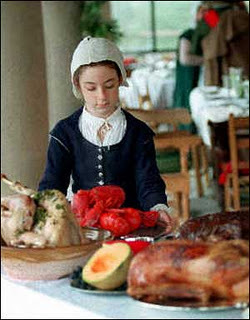 Degory came alone on the Mayflower, planning to bring wife and children later after the colony was better established. His death the first winter ended those plans. His wife remarried to Godbert Godbertson in Leiden, and they had a son Samuel together. Godbert, his wife Sarah, their son Samuel, and his step-children Mary and Sarah Priest all came on the ship Anne to Plymouth in 1623. According to the Mayflower Society, no one has yet proven that Sarah, B: 1627 lived until adulthood. Proof of that would tie up the line to the Mayflower. Isaac’s second wife Elizabeth Willoughby was born 1635 in New Haven, New Haven, Connecticut. Her parents were Capt. Thomas Willoughby and Alice [__?__]. She was widow of Simon Overzee and Major George Colclough. Elizabeth died 1672 in Cople Parish, Westmoreland, Virginia. Isaac Allerton Jr. (c. 1630– 30 Dec 1702), the son of Mayflower Pilgrim Isaac Allerton and Fear Brewster, and was a Colonel, Merchant, and trader in Colonial America. He was first in business with his father in New England, and after his father’s death, in Virginia. He was a Burgess for Northumberland County and a Councilor of Virginia. Isaac, was born to Fear in 1630 and. By 1653 he was active in his father’s trading activities. Following the death of his mother (Fear) in 1633, Isaac (Jr.) was raised by his grandfather William Brewster. When Isaac’s father removed to New Amsterdam in 1638 he remained at Plymouth with his grandfather Elder William BREWSTER, by whom he was being educated. Brewster died in 1644 and Isaac Jr. joined the family of his uncle Love Brewster. In order to enter Harvard, Isaac Jr. needed to demonstrate a certain level of academic achievement and secondly, the recommendation from a prominent individual(s). Allerton Sr. had the wealth for his son’s education and it is suspected that William Brewster, who had the largest library in Plymouth, provided the education and recommendation needed to be accepted in Harvard. Isaac Jr. was among nine men in the seventh class to graduate from Harvard in 1650. By 1653 he was active in his father’s trading activities. Because of the general ire of the Plymouth Colony against his father, he had moved to the New Haven Colony. When his wife Elizabeth died circa 1660, he moved his family to Northumberland County, in Virginia’s Northern Neck. Initially he settled inWicomico at the far eastern end of the county on land adjacent to the Chesapeake Bay and in the vicinity of the plantation of Richard Lee II. As a tobacco planter-merchant Allerton probably constructed a wharf and warehouse (as his father had done in New Amsterdam) since financial success required both growing and transporting tobacco. Whether Allerton bought land from his neighbor Richard Lee II or acquired it over time is not known. He may have acquired the land from his marriage to Elizabeth, who would have acquired it from her previous marriages or from her parents. In any event, Allerton’s family became wealthy, with indentured servants, and owned a 2,150-acre plantation on the south side of the Rappahannock River. 1663 – Allerton was a justice of Northumberland County. 1667 – He was a member of the “Committee of the Association of Northumberland, Westmoreland and Stafford Counties”. He became a member of the Virginia militia and ultimately rose to the rank of colonel. As a major in 1667, he served as second in command under Colonel John Washington, the great-grandfather of President George Washington, in order to subdue Susquehannock and Doeg Indians, who were raiding settlements. Allerton served as justice of the peace and member of the House of Burgesses in 1676-77. In 1688, he along with Captain George Brent of Stafford County, Virginia (former Governor of Maryland) and Captain Lawrence Washington (younger brother of George Washington’s Great grandfather John Washington) were named by their friend, Colonel Nicholas Spencer to serve as trustees of his estates. Captain Washington, named by Spencer as a trustee, was the younger brother of Lieutenant Colonel John Washington and was born in 1635. The trustees named by Colonel Spencer in his will received forty shillings for mourning rings. i. Elizabeth Allerton b. 27 Sep 1653 New Haven, CT; m. Benjamin Starr (b. Yarmouth, Barnstable, Mass.) the grandson of Doctor Comfort Starr of Boston (who emigrated from Ashford, Kent and founded Cambridge, Massachusetts and Harvard College) and nephew of Hannah Starr, the wife of John Cutt (the first President of the Province of New Hampshire). Following Starr’s early death, Elizabeth married his first cousin Simon Ayers/Eyres/Eyre of New Haven. ii. Isaac Allerton III b. 11 Jun 1655 New Haven, CT He accompanied his father to Virginia when he was a child, but returned to New Haven about 1683 and lived there most of the remainder of his life. Sarah and Hancock Lee are the great-grandparents of President Zachary Taylor, through their daughter Elizabeth Lee and grandson Colonel Richard Taylor, an officer in the Continental Army. This entry was posted in 13th Generation, Artistic Representation, First Comer, Immigrant - England, Line - Shaw, Storied, Wikipedia Famous and tagged 1st Birth, 1st Yankee Trader, Great Colonial Hurricane of 1635, Mayflower, Signature, The Anne - 1623, Thomas Morton (Colonist), William Brewster. Bookmark the permalink. My great grandmother was Delia Kibbe Allen who grew up in Connecticutt. She was a descendant to Isaac and Mary Allerton. I live in Oregon; and I visited Plymouth Plantation, and other Allerton sites in the Boston Harbor area this past October 2016. Am in the process of writing a family biography based on many years of research on both my maternal and paternal sides of family. Allertons will be covered. Such intrigue this family history stuff! Anyone wishing to exchange email with me, I would enjoy that and be most grateful. Please send your communication to my email address only, as I am not on Facebook. Hi Laura. My name is Kathleen Kemick and I am also descended from Isaac and Mary Allerton, through his daughter Mary and her husband Thomas Cushman. My maternal grandmother is a Cushman. I have traced her line all the way back to Edward Allerton (as of two days ago). I am always thrilled to meet a new ‘cousin.’ Keep up the good work!